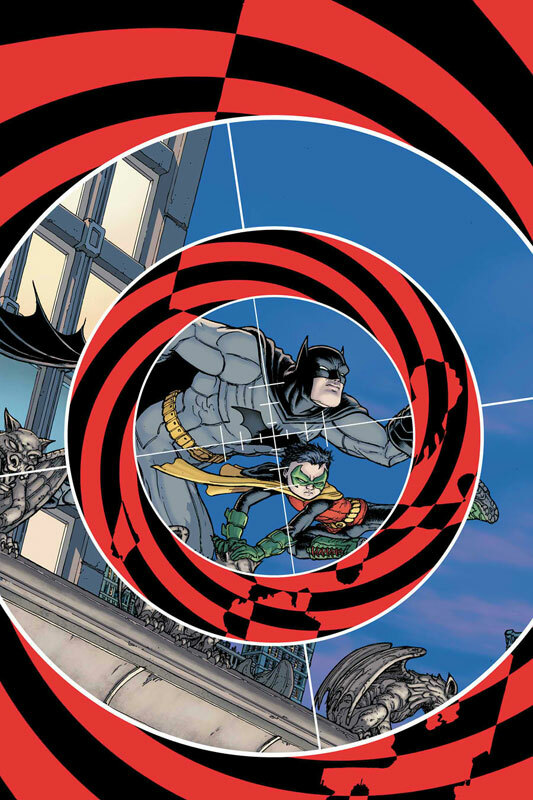 Batman Incorporated #1 (DC Comics – $2.99): I’ve written a very extensive feature on why Batman Incorporated #1 is something that you should be reading today, so make sure to go there and check out all of the reasons, since it deserves all the attention in the world: Comics You Should Be Reading: Batman Incorporated. However, if this isn’t enough for you (it should be), you should also check out Justice League Dark as it’s the debut issue of new (fantastic) series writer, Jeff Lemire. Also, be on the lookout for Dark Horse Presents this week because of so many reasons including Evan Dorkin being hilarious and Francesco Francavilla being pulpy. And then “Dirty Hench” has some suggestions, also. Also, I’ve taken up way too much time, but if you’re looking for a non-Batman related collection, pick up Makeshift Miracle because that’s one of the best decisions you could make. The other best decision you could make, especially if you’re looking for some non-Batman Chris Burnham work, check out the The Amory Wars: In Keeping Secrets of Silent Earth: 3 Ultimate Edition Hardcover, which is an awesome sci-fi comic by Claudio Sanchez (lead singer of Coheed and Cambria), Peter David, and interior art from Burnham (until DC snatched him up) and Key of Z collaborator, Aaron Kuder. HERO Comics 2012 (HERO Initiative – $3.99): Every year the HERO Initiative releases a book featuring a collection of some of the best talents in comics, with the proceeds going to help comic creators who are in need, and this year’s edition is out this week. If there is one book out this week that you should pick up, it’s this one. The HERO Imitative does a lot of great work helping out creators who don’t have the means to get medical aid or other necessities of life, and they are a great cause that deserves your support. I don’t care if you buy this issue and then put it directly in the trash, or give it back to the store so they can sell it again, or whatever. The good news if you buy it is, you probably won’t want to throw it away, you’ll want to read it, which is kind of the whole point, or at least part of the point. If you buy it, you get a new Teenage Mutant Ninja Turtles story written and drawn by creator Kevin Eastman, as well as a new Red Star story, a new Elephantmen story with art by Dave Sim, and much more. It is 32 pages, no ads, for $3.99. Even if you don’t feel like picking this issue up, or if your store doesn’t stock it, consider going to the HERO Initiative webpage and consider making a donation. Mind MGMT #1 (Dark Horse Comics – $3.99): Mind MGMT comes to us from creator Matt Kindt, whose previous work includes Super Spy and 3 Story, ad who is an indie creator on the rise. The series follows a reporter who stumbles upon a secret project called the Mind Management program. There are psychics, dolphins, hypnotic advertising and a bunch of other topics dealing with the mind. The story is described as Akira meets Heart of Darkness by way of 100 Bullets which sounds like a pretty potent combination to me. Kindt has a unique and detailed art style, and this will be the first extended work of his that I have read, and I am looking forward to it. Mind MGMT sounds like a great action thriller with some sci-fi mixed in, and I’ll always give a book like that a shot. Youngblood #71 (Image Comics – $2.99): I would make fellow Geek of Doom writer PSHayes very sad if I did not talk about the relaunch of Youngblood. Now this is a book that basically sells itself or doesn’t, depending on your opinion of Rob Liefeld. If you don’t mind his work and have a fondness for the early Image days, you’re going to want to pick this up. If you’re not a fan of Liefeld, I doubt that this book is going to change your opinion of his oeuvre. This is the old Youngblood team back together, fighting villains and saving the world. It is what it is; fun action comics with big colorful heroes punching villains in the face. And there’s nothing wrong with that. The art for this issue is by Liefeld and Jon Malin, and what you end up with is a book that mostly looks like a Liefeld book, but with a few tweaks here and there. It’s exactly what you would expect, so you shouldn’t be surprised by the art of the book. There is a strong core audience who will get a kick out of this issue, and if you’re in that audience, make sure you don’t miss out on this one. Comic Book History of Comics (IDW Publishing – $21.99): If you’ve read Fred Van Lente and Ryan Dunlavey’s Action Philosophers, you should already know why you should buy this book. If you haven’t read Action Philosophers, I highly recommend that you do, not that you need to have read it to enjoy this book. What this book does is take the real history of the comic book industry and shows how things happened, while poking a little fun at those involved. Van Lente and Dunlavey have found the perfect mix of fact and humor and make reading about subjects that may be considered boring by some into an absolute joy. Dunlavey’s art is cartoonish and expressive and the perfect fit for this book. I’ve read most of these issues already, but I can’t wait to read them and laugh all over again. Seriously, if you have any interest in comics, you should pick this up. It will entertain and enlighten. And once you’re done, go find Action Philosophers, and then be on the lookout for their next series, Action Presidents, which promises to be a lot of fun. If you’re looking for something less historic and more story based, keep an eye out for Foot Soldiers, Vol. 1 from Image Comics, for $19.99. This is a collection of some of Michael Avon Oeming’s (Powers) earlier work. It’s all superheroes is a dystopian future, and is a bit of a cult classic. The other book to check out is The Cape, Vol. 1 from IDW Publishing ($24.99). This is the hardcover collection of one of my favorite single issues of the last few years, as well as the mini-series that followed up on it. The tagline for the book is “You will believe a bad man can fly” and that’s a pretty good summation of the series. The art by Zach Howard is great and the story has a lot of twists and turns that you won’t see coming.